Joyce and I joined my former students William and Morgan Willer who directed and produced the short film, "There." Joyce served on crew, and I played a father in search of his daughter during a storm who finds that he has to decide between getting her to safety and bringing a woman in labor to the hospital in his two-seat car. You Should Be THERE: A Short Film from William Willer on Vimeo. Joyce played my character's wife while the cameras weren't rolling. 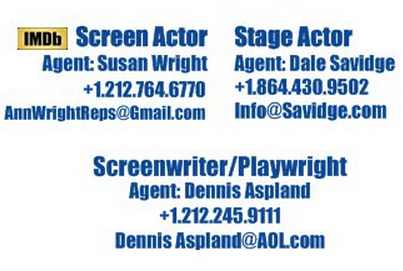 It was a sociodrama to help get our 22nd screen daughter ready for an emotional phone call. We were all deeply moved by the experience, and hopefully you'll hear that in her performance. It was an official selection at the Christian Worldview Film Festival and the International Christian Film and Music Festival, where I was nominated for Best Lead Actor in a Short Film. 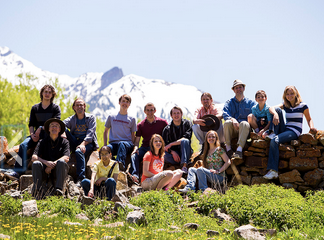 William and Morgan attended the Rocky Mountain Christian Filmmakers Camp in 2016. William was on the filmmaking side, and Morgan was one of my actors. Our film for that year, "Felicia's Pledge": www.RichDrama.com/FeliciasPledge. The next summer the siblings switched places and I got to work with William. Our short film that year was "Milk and Oranges": www.RichDrama.com/MilkAndOranges. We also got to work with other Rocky Mountain Christian Filmmakers Camp alumni: Rebekah Stought, who plays the expectant mother, did both camps in the summer of 2015, when we offered two week-long camps back-to-back. Click here to see the film Rebekah directed and the two in which she performed. Gwendelynn Martindale was a filmmaking student, and she wrote, produced and directed her own short film, "One Day." Though RMCFC alumna Gabby Campana needed to be out of town during filming, she helped with pre and post-production. While we were there we got to see her in a really fun short she starred in with the Willers. While we were on set, RMCFC alumna McKenzie Harris got a call-back to play the lead in a Lamplighter Theatre production, of The Treasure of the Secret Cove. The production team listened to over 250 auditions without considering who the actors were. They were shocked to discover McKenzie was also an alumna of the Lamplighter Guild, where I got to teach this summer. Of course, my own bride attended the Rocky Mountain Christian Filmmakers Camp as well. The short she directed (...for one scene, and she did cinematography, lighting and sound for other scenes) is now online: www.RichDrama.com/MilkAndOranges. Sign up for the announcement that registration is open for the next Rocky Mountain Christian Filmmakers Camp. This interview with Ruth Friesen and my grandmother, Hilda Miller, is in 1987. I digitized it from a VHS cassette in 2009, and searched the web for Ruth Friesen and her show, Beauty of Life. I wanted to get her blessing to post the program, but there was no online record of the show’s name paired with her name. Recently my wife, Joyce, and I have been involved with Christian Union’s Great Experiment. We’ve committed to five disciplines for a month, and one of them is asking the Lord every morning what he wants us to do that day. Joyce calls it a concrete kindness for the Lord. Two days ago I felt like the Lord was asking me to look into posting this interview. This time the internet pulled up Ruth’s name in her obituary. She died this April. I reached out to her family by Facebook and noticed that they’re friends with Grandma’s niece’s husband. I reached out to him, and he said the son-in-law just Friended him on Facebook! Soon the family got back to me with their blessing, and then I saw why the Lord had prompted me now. One of Ruth’s daughters pointed out that this will be their family’s first Thanksgiving without her mother. I'm so glad they'll have this wonderful memory to share today. The interview is mostly about Grandma’s prison ministry, and it reminded me that I was 10 years old when Grandma first brought me in with her to minister to the first prisoner she mentions. I continued to go with her from time to time throughout the rest of her ministry. Throughout my career I’ve performed and taught in a few prisons, and I know that was on my heart because of Grandma's prison ministry. My most dramatic encounter was earlier this year in the gang unit on Riker’s Island. Grandma talks about how much energy the Lord was giving her, but within a year she sensed him telling her, “Get your affairs in order.” As a high schooler I remember thinking, “Does God want her to clean her room?” July of 1988 she was diagnosed with pancreatic cancer. The Lord kept shining through her right to the end, which was three months later. She was a tremendous witness to the doctors and nurses attending her. One of the nurses told me how she was feeling a bit down one day, and there was Grandma, jaundiced and taking her final breaths to encourage her. I count Grandma my greatest spiritual mentor and pray I can encourage others right to the end. For those of you who watch this who aren’t family, I can’t expect that you’ll be as blessed as we are by this interview. I’m writing this after just having seen it for the first time in eight years, and I’m a blubbering mess! I do pray it will give you a sense of gratitude for family members and friends who have represented the Lord well to you. Watch the video below, or if you're receiving this via email go to www.Blog.RichDrama.com (Thanksgiving Day). For more information on Grandma’s mission work in Kenya click here. To read about the miracle that kickstarted Grandma's ministry click here. To find out more about a relationship with the Lord, visit www.RichDrama.com/MyPassion. I open our Thanksgiving Eve service and introduce the video below. Later in the service I share about the short film, “All God’s Children," in which I play God. You can now watch that below. Rachel Taylor takes us through Psalm 107. All God's Children from Joseph Holmes on Vimeo. We're getting close to opening registration for next summer's Rocky Mountain Christian Filmmakers Camp. Don't miss the announcement! This morning I got to chat with with Donald James Parker on his first video interview for The Sword of the Spirit. You can watch below, or if you're receiving this via email, visit www.Blog.RichDrama.com. • In Chariots of Fire it was Jackson Sholz who hands Eric Liddell the piece of paper saying, "In the old book it says: He who honors me, I will honor.” (I Samuel 2:30) In reality it was an American masseur who gave him the paper. Robert Puncher played our 21st screen child. Joyce and I performed in this short film by Joseph Holmes. Joyce played an anxious woman, and I got to play the role of God, for which I was nominated for Best Lead Actor in a Short Film at the International Christian Film Festival and Best Comedic Performance at the Hollywood Divine International Film Festival. Here's a great article on our director: Meeting God Halfway. Though we didn't play husband and wife. Her character had a son, and I played [Spoiler alert! Highlight the following text to see my role: the Heavenly Father of the young man], so we're counting him as our 21st screen child. 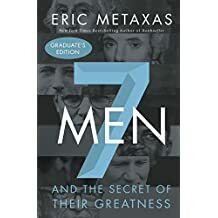 Eric Metaxas, who kindly let us use his testimony for a site we set up for people we encountered in Russia during the Sochi Olympics (www.WhoistheFish.com), has written a brief but thorough chapter on Eric Liddell in this book featuring six other luminaries in the Kingdom of God. Metaxas is a skilled writer, and he brought me to tears with material I’ve known for years. I was also delighted by some surprises. He found an interview with Horatio Fitch, who raced Liddell in the 400 meters at the Paris Olympics. Fitch had broken the world record in one of the semi-final heats, and in his interview in 1984 Fitch said, “Our coach told me not to worry about Liddell because he was a sprinter, and he’d pass out 50 yards from the finish.” The 1981 movie Chariots of Fire shows how Liddell was expected to prove himself the fastest man alive in the 100 meters, but refused to run a heat on a Sunday, the Lord’s Day. Liddell ended up breaking Fitch’s world record in the 400 meters, beating him by five meters. It was decades before the spread between first and second in that race was greater. came to the feeling that a need existed, [and] it was the Christlike thing to do to let them play with the equipment and to be with them…because it was more Christlike to do it than to [follow] the letter of the law and let them run amok by themselves. In the new film Eric’s reason to run was also more Christlike than following the letter of the law, in fact he saw it as a matter of life and death. Joseph Fiennes (who plays Liddell in the film) does a fine job carrying the weight of the challenge in his countenance. I was just disappointed that it wasn’t explored more in the film. He was literally God-Controlled, in his thoughts, judgements, actions, words to an extent I have never seen surpassed, and rarely seen equalled. Every morning he rose early to pray and read the Bible in silence: talking and listening to God, pondering the day ahead and often smiling as if at a private joke. Metaxas does a brilliant job summarizing every chapter of Liddell’s life but one. There’s no mention of Liddell’s world-class running that continued in China. Beyond the Chariots portrays how he tied the winning times for the Amsterdam Olympics in 1928 at a meet in China with Olympic athletes from France and Japan. For a fuller exploration of those athletic exploits I recommend David McCasland’s Pure Gold: Eric Liddell and John Keddie’s Running the Race. I count McCasland’s the authoritative biography on Liddell, and Keddie was a Scottish runner himself and tied Eric’s time on at least one track. I believe the fact that Liddell continued to run at world-class speed after moving to China only one year after winning Olympic gold amplifies his sacrifice to leave all of that glory behind to give his all to the One who gave His all for him. ChristianCinema.com is featuring my one-man play Beyond the Chariots on their Facebook page today! We'd be ever so grateful if you'd give it a Like and a share! The more likes and shares the more of their core base will see it in their news feed. This is our greatest opportunity to reach the maximum audience. Click here. See the rest of Olympic champion Eric Liddell's Chariots of Fire story by arranging for a public license or by booking a live performance of Beyond the Chariots.